The Intero Foundation donated another $1,000 to the Nevada County Diaper Project last week along with a $500 grant to the Keeping Kids Safe Program. John and Edie have just opened their fourth office in Nevada County with the most recent office located at 227 Broad Street in the heart of Nevada City. 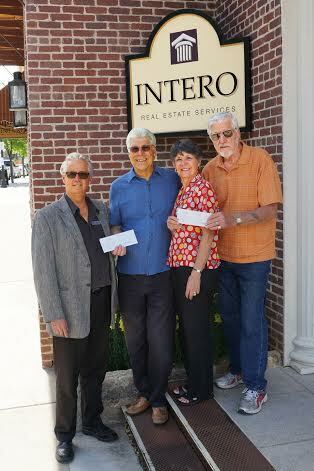 To date Intero has raised over $23,000 locally and the Foundation over $3,300,000 worldwide. “The money we raise here, stays here to help our children.” Miller says “Every Real Estate agent in our company gives a portion of their commissions earned to our foundation. I am very proud of the fact we have 100% participation. We also get a great turn out from the agents, the administration staff and our preferred vendors for our fundraisers.” Evergreen Home Loans donated $500 to get the donation ball rolling and will be volunteering to help with the setup as well. Want to Organize a Diaper Drive? Want to host a diaper drive on our behalf? Please Contact us to give us a heads up. Helpamotherout.org has provided a toolkit that you can download in order to jumpstart your Nevada County Diaper Drive.